“Never waste a good crisis,” EEDC President & CEO Brad Ferguson told the hundreds of Edmonton business leaders gathered today at the Shaw Conference Centre for EEDC’s annual Impact luncheon. He channeled local business pioneer Frank Spinelli and said “it’s what you do in the good times that determines how well you perform in the bad times.” He argued that Edmonton and EEDC in particular have done a lot of great things over the last two years when times were good and that means the year ahead won’t be as bad as many anticipate. 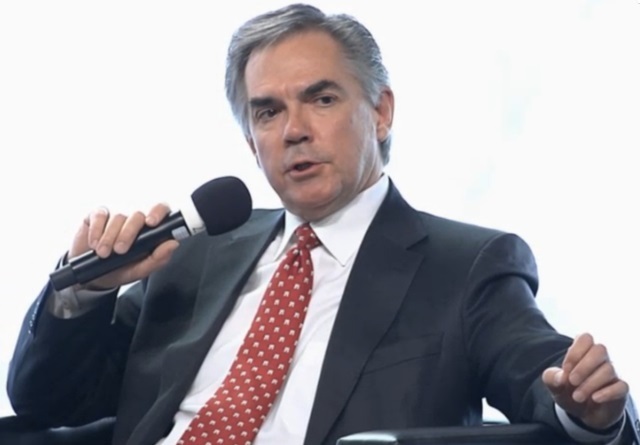 A short while later, Premier Jim Prentice took to the stage and disagreed. “It is what we are going to do in the bad times that will determine how successful we’re going to be in the good times,” he said. The Premier talked about the need to change both the income and expense side of the equation, and cautioned that all Albertans will have a role to play in making it through a difficult time. So which is it? Well, it’s probably a little bit of both. The feeling I was left with after today’s luncheon is that Edmonton has been doing the right things and will weather the coming storm better than the province as a whole. Before the keynote began, EEDC showed their Build It Here video, highlighting the fact that it can be customized for businesses to use in their own materials. 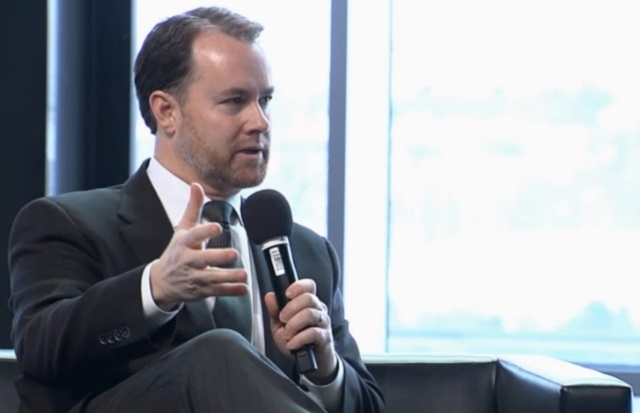 Brad talked about the way EIA and EEDC are working together so effectively now, which resulted in the KLM flight. He discussed the new approach to tourism and marketing. He mentioned the big announcements that were made recently and said “more than anything else, 2014 will be remembered as the year of downtown.” He talked about the importance of event attraction, saying that big events “create a rhythm and a pulse and an energy that builds excitement and confidence.” He praised the mayor’s leadership in the region and on speaking with a unified voice. And he referenced the many newspaper and magazine articles that have been popping up across the country talking about Edmonton’s transformation. Brad had a lot of praise for his colleagues. “I am extremely proud of the team we have built at EEDC.” He said the organization has reduced the portion of its operating budget that comes from the City, from 43% when Brad took over to 38% today. Brad said they’re on track to reduce that even further to 33% by 2017. 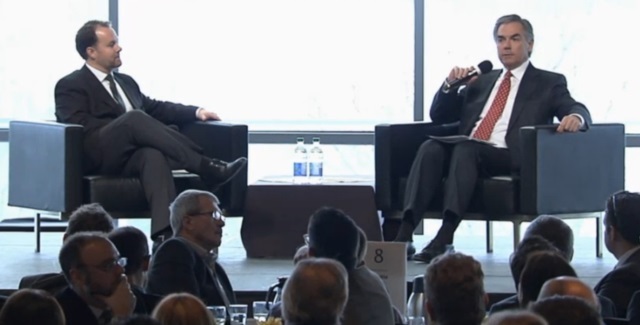 After the keynote, Premier Jim Prentice joined Brad on stage for a fireside chat, sans fire. “This is a world class city, with world class leadership,” he said. He disagreed with Brad about the good times/bad times point-of-view, then said that “this year will be about leadership and confidence.” Premier Prentice predicted that 2015 will be a challenging year, but also a transformational one. Perhaps thinking ahead to the budget, Premier Prentice talked about what to expect. “First and foremost we need a fiscal plan than Albertans can look at and have certainty,” he said. And knowing that the roller coaster cannot continue, “it has to be a ten year plan.” He said that oil “may always be the family business” but said that diversification is important. EEDC Board Chair Barry Travers brought greetings on behalf of the board of directors, and introduced all of his colleagues. The event was hosted by Grant Ainsley and featured a giant Twitter wall powered by Freeman Audio Visual and SAM that received rave reviews from attendees. Everyone received a copy of “Navigating Your Economic Future in Edmonton: A Guide for Business Leaders”. The entire event was livestreamed by the Edmonton Journal, which you can watch here.